Veteran Late Model Stock car racer Lee Pulliam took the victory Saturday in the Response Energy 100 CARS Tour event, one of the feature races in the Rusty Wallace Automotive Group Short Track U.S. Nationals at historic Bristol Motor Speedway. Track and series representatives declared the race official after 64 laps when weather moved into the area. Just before the race-ending caution flew, Pulliam battled with defending winner Myatt Snyder for the lead and then held off a strong challenge from hard-charging Layne Riggs in the closing laps. "I was trying to be cautious," Pulliam said. "You are running so fast here I was trying to not wreck (Myatt). I wanted to race him hard but not wreck him. I was able to maintain it and was able to hold him off. I like to win races, that's the main goal and it's what it's all about for me." Pulliam, who started 24th in the qualifying order, claimed his first Bristol victory at the controls of his Kiker Tree Service Chevrolet. 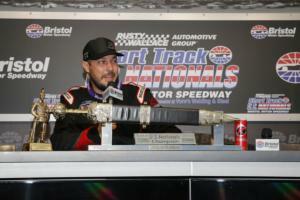 It was Pulliam's second win of the season on the CARS Tour and his fourth top five finish. "It's pretty awesome," Pulliam said. "I had a hard hit here in 2014 in a K&N car when I was running third and contending for a win. It's special to come back here and run so well and win in front of my wife and daughter. "I was always a big Dale Earnhardt Sr. fan and he always did well here. I remember those races with him and Terry Labonte. Anytime you can get a win here with the history, it's pretty special." Riggs finished second, Snider was third and Ty Gibbs finished fourth in his No. 18 machine. Josh Berry, who drives the No. 88 for JR Motorsports, finished fifth. Ohio driver Kyle Purvis took the checkered flag in the 50-lap Modified feature race. Purvis drove his No. 13 Farm Transport/Purvis Properties machine to the win, holding off Damon Breedlove and Bruce Bennett Jr., who finished second and third respectively. Ricky Wilson and Bill Honious advanced to the Compact A feature with their respective victories in the Compact B and C feature races. Sunday's racing will include the weather-delayed 50-lap Compact A feature at 10:30 a.m., followed by practice for the Super Late Model and Street Stock divisions. Racing starts at 2 p.m. highlighted by the 100-lap Super Late Model feature and the 50-lap Street Stock A feature. Tickets ($35 for adults and $5 for kids 12 and under) are available for Sunday's racing by calling (866) 415-4158 or by visiting www.bristoltix.com.